This week’s video tip comes to you from a long drive champ and a former long drive world record holder Brad Peterson. How you take the golf club to the top of your backswing has a huge effect on your swing path and the power of your golf shots. That’s why this week’s video is so important. Let’s start off with the basics. Each person will have a unique backswing that should feel comfortable, but all good golf backswings should have a few things in common. First they should all rely primarily on the twisting motion of the torso to get the club back. This twisting of the torso stores power. Second, you should always load your wrists in the backswing. Loading the wrists means that the club shaft is at about a 90 angle to your hands at the top of the swing. This loading action stores power to be released through impact. Third, a great golf backswing should set you up to have a proper swing path for the downswing. This last point is the main focus of this video. A proper swing path creates consistency and accuracy. If you get the other two right you may be storing a lot of power, but when your swing path is off you won’t be able to translate that power into long straight golf shots. To get your swing path off to a good start you need to pay attention to where your hands and club are at the top of your backswing. As Brad explains in the video, when your hands are too far back your golf club swing path will be too flat. You’ll have trouble getting solid contact with the ball and your shots won’t be straight. If your hands are too far forward (toward your head) you’ll also have trouble hitting consistent golf shots because your swing path will be too steep. This usually results in popped up shots, you know, the ones that leave a nasty mark on the top of your driver. Learning these principles is easy, it’s feeling them and knowing where the happy medium is that’s the tough part. As Brad demonstrates in the video that happy medium is usually when your hands and the golf club are over the space between your head and your right shoulder. A great way to visually check this in your own swing is to get in front of a full length mirror and go through the motions. Just remember to keep an eye on the ceiling fan. Remember making a solid connection at impact is a lot easier when you start your downswing from the right spot. 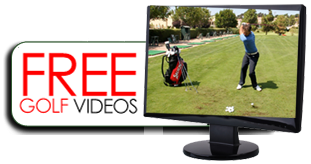 To get your hands on Brad’s A-Z golf instructional program check out his 7 Steps to Smokin’ Hot Club Head Speed DVD Package. Doc here with another Golf Tip for you. This one comes from my good friend Billy McKinney. I call it The Tee Box Control Drill, and this drill will give you a confidence boost like no other right from the start of each hole! I’ll tell you what, when I first learned about this drill I tried it out on the driving range by taking my time with each shot I took. Visualizing everything from a dog leg left with water hugging the left side of the bend, to a dog leg right with a bunker lying right in front of my targeted flag stick. After only one bucket of balls, I went out and had my best round of golf in months, my golfing pals were all left stunned in amazement on how low my score was. It was all they could talk about back at the clubhouse! Anyways in this tip, Billy shows you how ball placement at the start of every tee shot can effectively help your game and boost your confidence by providing you with the best shot possible down the fairway. If you would like to purchase Billys’s Avalanche of Power Video Package, which this tip was taken from, simply click on the link below. Till next time… for better golf. Doc here, I’ve been so busy the past few months working on a secret little project of mine that I completely lost track of time. I can’t get into much detail about it just yet, but once this thing is completed I will definitely be letting you know about it. 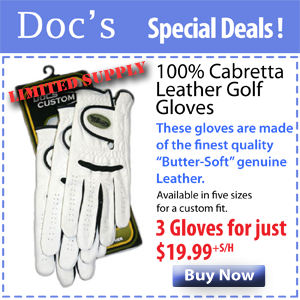 Hello again, it’s Doc…Good News — another golf video tip for you. of the games most respected teachers. and over-power it…Get this down and you’ll learn to hit it hard. …you can either avoid it…over power it…or harness it. I’ll keep you in the loop with more golf tips. waay before they get to the ball…Simple to fix! the shaft by activating the arms and hands during the down-stroke. ball is killing all your power and distance. Forget it… it doesn’t work. If you would like to purchase Les Johnson’s High Thrust Power Video Package, simply click on the link below. Til next time… for better golf. and straighter drives you’ve ever seen. …perfect impact alignments — forward lean at the moment of truth. see your swing improve quickly. Do yourself a favor…Try It Out! and it forces you to keep you right wrist bent at impact.